If you were lucky enough to see Mama Kin Spender at this year’s Perth Festival, you’ll know that this band is spinning some musical magic, with its charismatic blend of alt-rock rhythms and rich harmonies. As the name suggests, the ensemble brings together Fremantle’s Mama Kin with Melbourne musician/producer Tommy Spender, plus a special extra ingredient… a choir, directed and arranged by Virginia Bott, also from Melbourne. For those who didn’t catch the band at the Festival, or who just want more, Mama Kin Spender will be at Fairbridge Festival this April. Nina Levy caught up with Tommy Spender ahead of the gig. Nina Levy: I believe you and Danielle go way back… how did you originally meet? Tommy Spender: Great question! Danielle and I met on a flight to Los Angeles from Melbourne. She was sitting a few seats in front of me and we were trying to work out how we knew each other, when suddenly it dawned on us that I’d just joined her brother’s band! Which was weird because we had not really heard of each other before..
NL: What made the two of you decide to come together as Mama Kin Spender? TS: We really just wanted to have a project that would give us an excuse to hang out more as we live on opposite sides of Australia. NL: And the choir… where did that concept come from? Early on we realised we needed someone to help us with the choir admin, logistics and conducting. We didn’t have to look far as a very dear mutual friend called Virginia Bott runs an amazing choir in Melbourne called First Chorus Band of Singers. NL: Tell me about the creative process for making Mama Kin Spender’s debut album, Golden Magnetic. Did incorporating a choral element change/influence the song-writing and recording process? TS: We had decided to make songs that stood up on their own two feet so we could either snap in a choir or still put on a show as a two-piece. The songs were mostly written over a 10 week period remotely, in an hour per week. We came together in a studio with 10 brand new songs each and set to work chipping away at all the unfinished bits while maintaining the strong ideas. NL: You source your choirs locally when you tour – how does that work? TS: We approached Virginia early on so that she could get in the studio with us and have time to help arrange and score all the charts, so we have material to send the choirs before we meet up with them. We normally leave a six-week period for the choir to work away on the songs, then fly in one or two days before our show to rehearse and finesse all the parts with them and Virginia. This is one of our favourite parts of the project as choirs all have different feels and sounds. It’s a real meeting of the worlds! 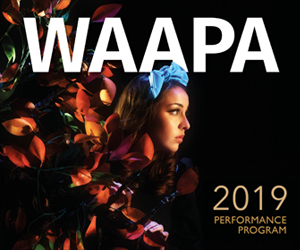 NL: At the Perth Festival gig you worked with the WAAPA Gospel Choir… do you have a type of choir you prefer/seek? TS: We love working with community choirs for a number of reasons. They bring so much heart and excitement to rehearsals and shows. The WAAPA choir were the most incredible sounding choir and were ALSO legends. They set the bench mark so high! We’ve also worked with a gospel choir in Adelaide called Gospo. Such an incredible tone! NL: What is it about working with choirs that is so special? TS: It just brings such a truly rare and unique sound to our songs. Most people when they think “choir” think religious music with boring parts that sound “chorale”. Our songs and arrangements all come from the same blue print which is a kind of raw, bluesy, folky sound and feeling. There is a lot of groove and complex phrasing and harmony in the parts but when it all comes together it sounds like an an amazing colourful tidal wave of golden voices! You can catch Mama Kin Spender at Fairbridge Festival, which is taking place 20-22 April. Head to fairbridgefestival.com.au for the Festival program.